The Tarim mummies, a series of mummies were discovered in Tarim Basin, present day Xinjiang, China and are believed to date from 1800 BCE to 200 CE. The Tarim Mummies have been constantly debated since their discovery due to fear that the DNA of the Tarim Mummies would disprove the claims of the nationalist Uyghur of being indigenous to the region and different studies of the mummies have resulted in conflicting theories. Some scientists are of the belief that they have the appearances of western Eurasia while others believe that they are exclusively Caucasoid or Europoid. The mummies mostly the early ones are often connected with the presence of the Indo-European Tocharian language in the Tarim Basin but the evidence is not completely convincing and many centuries tend to separate the mummies from the first attestation of the Tocharian languages in writing. The team of Victor H, Mair, a professor from University of Pennsylvania and project leader, was of the conclusion that the mummies were Europoid, the likely speakers of Indo-European language. The likely presence of speakers of Indo-European languages in the Tarim Basin towards 2000 BCE, if confirmed could be interpreted as evidence that the cultural exchange had taken place between the Indo-European and Chinese population at an early date. It had been proposed that such activities such as chariot warfare as well as bronze-making could have been transmitted to the east by these Indo-European wanderers. The DNA data sequence portrayed that the mummies had Haplogroup R 1a – Y-DNA typical of western Eurasia in the region of East-Central Europe, Central Asia and Indus Valley. Chinese and American researcher team working in Sweden had tested DNA from 52 different mummies inclusive of the mummy designated `Beauty of Loulan’, wherein her features had been described as Nordic in appearance. 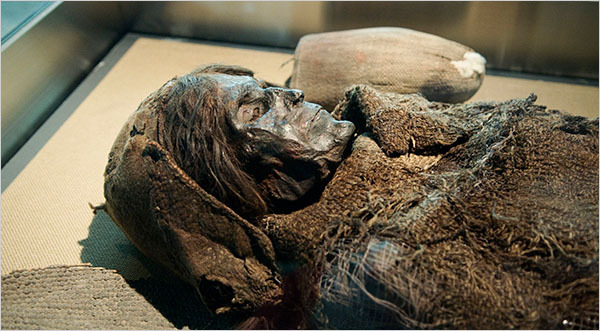 She was around 45 years old when she died and genetically mapping the origins of the mummies, the researchers confirmed that the mummies were of West Eurasian decent. Victor Mair has commented that these studies were very important since they link up eastern and western Eurasia at a formative stage of civilization in a much closer way than has ever been done before. An earlier study by Jilin University had observed an mtDNA haplotype characteristic of Western Eurasian population with Europoid genes. The Chinese government, in 2007 had allowed a National Geographic Society team lead by Spencer Wells to examine the DNA of the mummies. Wells could extract undegraded DNA from the internal tissues. The scientist had extracted adequate material to recommend the Tarim Basin was constantly inhabited from 2000 BCE to 300 BCE and initial results showed that the people instead of having a single origin, had originated from Europe, Mesopotamia, Indus Valley and other areas which are yet to be determined. It has been affirmed that the textiles found with the mummies are of early European textile type based on close resemblances to fragmentary textiles found in salt mines in Austria, dating from the second millennium BCE. Anthropologist Irene Good, specialist in early Eurasian textiles, noted the woven diagonal twill pattern specified the use of a sophisticated loom and she states that the textile is the easternmost known example of this type of weaving technique.